A sign welcomes visitors to the twin cities of Bristol, Virginia and Bristol, Tennessee. State Street separates Virginia (left) and Tennessee (right). Bristol is a city in Sullivan County, Tennessee, United States. The population was 26,702 at the 2010 census. It is the twin city of Bristol, Virginia, which lies directly across the state line between Tennessee and Virginia. 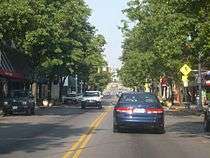 The boundary between the two cities is also the state line, which runs along State Street in their common downtown district. 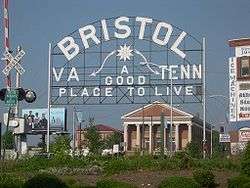 Bristol is a principal city of the Kingsport−Bristol−Bristol, TN-VA Metropolitan Statistical Area, which is a component of the Johnson City−Kingsport−Bristol, TN-VA Combined Statistical Area − commonly known as the "Tri-Cities" region. Bristol is probably best known for being the site of some of the first commercial recordings of country music, showcasing Jimmie Rodgers and the Carter Family, and later a favorite venue of the mountain musician Uncle Charlie Osborne. The U.S. Congress recognized Bristol as the "Birthplace of Country Music" in 1998, and the Birthplace of Country Music Museum is located in Bristol. Bristol is the birthplace of Tennessee Ernie Ford. Bristol is also the site of Bristol Motor Speedway, a NASCAR short track, that normally sells out more than 160,000 seats twice annually, though attendance has come up short in recent years. For more details on this topic, see Bristol sessions and Music of East Tennessee. The Grand Guitar on West State Street. The U.S. Congress declared Bristol to be the "Birthplace of Country Music", according to a resolution passed in 1998, recognizing its contributions to early country music recordings and influence, and the Birthplace of Country Music Museum is located in Bristol. In 1927 record producer Ralph Peer of Victor Records began recording local musicians in Bristol, to attempt to capture the local sound of traditional "folk" music of the region. One of these local sounds was created by the Carter Family, which got its start on July 31, 1927, when A.P. Carter and his family journeyed from Maces Spring, Virginia, to Bristol to audition for Ralph Peer, who was seeking new talent for the relatively embryonic recording industry. They received $50 for each song they recorded. That same visit by Peer to Bristol also resulted in the first recordings by Jimmie Rodgers. Since 1994, the Birthplace of Country Music Alliance has promoted the city as a destination to learn about country music and the city's role in the creation of an entire music genre. Currently, the Alliance is organizing the building of a new Cultural Heritage Center to help educate the public about the history of country music in the region. Every year, during the third weekend in September, a music festival called the Bristol Rhythm & Roots Reunion takes place. The festival is held downtown, where Tennessee and Virginia meet, and it celebrates Bristol's heritage as the Birthplace of Country Music. 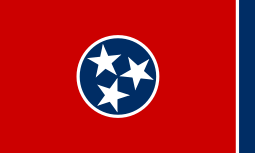 Bristol is located in the northeast corner of Tennessee, at 36°34′9″N 82°11′51″W﻿ / ﻿36.56917°N 82.19750°W﻿ / 36.56917; -82.19750 (36.569135, -82.197489). According to the United States Census Bureau, the city has a total area of 29.5 square miles (76.4 km2), of which 29.4 square miles (76.1 km2) is land and 0.1 square miles (0.3 km2) (0.44%) is water. Bristol features a humid subtropical climate with warm to hot summers and short, chilly winters. Due to the elevation of the city, Bristol does not quite experience the hot summers seen in other parts of the South and its winters are colder than many other cities in the region. Bristol on average sees roughly 40 inches of precipitation per year. Snow does occasionally fall in the city, as the city averages roughly 15 inches of snow annually. As of the census of 2000, there were 24,821 people, 10,648 households, and 6,825 families residing in the city. The population density in 2000 was 846 people per square mile (326.5/km²). There were 11,511 housing units at an average density of 392.2 per square mile (151.4/km²). The racial makeup of the city was 95.15% White, 2.97% African American, 0.31% Native American, 0.64% Asian, 0.01% Pacific Islander, 0.23% from other races, and 0.70% from two or more races. Hispanic or Latino of any race were 0.68% of the population. There were 10,648 households out of which 26.2% had children under the age of 18 living with them, 49.0% were married couples living together, 11.4% had a female householder with no husband present, and 35.9% were non-families. Nearly 32% of all households were made up of individuals, and 14.1% had someone living alone who was 65 years of age or older. The average household size was 2.26, and the average family size was 2.84. In the city the population was spread out, with 21.1% under the age of 18, 9.1% from 18 to 24, 27.2% from 25 to 44, 24.7% from 45 to 64, and 17.9% who were 65 years of age or older. The median age was 40 years. For every 100 females there were 90.6 males. For every 100 females age 18 and over, there were 87.3 males. The median income for a household in the city was $30,039, and the median income for a family was $37,341. Males had a median income of $28,210 versus $21,173 for females. The per capita income for the city was $18,535. About 11.5% of families and 15.0% of the population were below the poverty line, including 19.4% of those under age 18 and 12.0% of those age 65 or over. Bristol is the location of Bristol Motor Speedway, a NASCAR Sprint Cup track. Bristol is also home to Bristol Dragway, which hosts the Ford Thunder Valley Nationals, an NHRA national event. A Pittsburgh Pirates R-league minor league affiliate, the Bristol Pirates, plays its home games at DeVault Memorial Stadium in Bristol, Virginia. Note-WEMT is Licensed to Greeneville, Tennessee, but co-located with sister station WCYB-TV. The Bristol, Tennessee Police Department is the municipal law enforcement agency for the city. The BPD has 69 sworn officers and 25 civilian supportive staff. It also makes use of citizen volunteers as an auxiliary staff that saves the department over $100,000 annually. ↑ Bristol Chamber of Commerce, "About Bristol Archived December 21, 2012, at the Wayback Machine.." Retrieved: 17 January 2013. ↑ U.S. Census Quickfacts. Retrieved: 8 July 2013. 1 2 "Birthplace of Country Music", AmericasLibrary.gov, 2011, web: AL. ↑ David Sanjek, "All the Memories Money Can Buy: Marketing Authenticity and Manufacturing Authorship", p. 155–172 in Eric Weisbard, ed., This is Pop, Harvard University Press, 2004. ISBN 0-674-01321-2 (cloth), ISBN 0-674-01344-1 (paper). p. 158. 1 2 "BCMA - Birthplace of Country Music Alliance", BCMA, 2012, webpage: BCMA. ↑ "US Gazetteer files: 2010, 2000, and 1990". United States Census Bureau. 2011-02-12. Retrieved 2011-04-23. ↑ "Climate information for Bristol - Johnson City - Tennessee - South - United States". 2016. Retrieved October 11, 2011. ↑ "Bristol, TN Monthly Weather Forecast". Weather.com. Retrieved October 11, 2011. ↑ "Annual Estimates of the Resident Population for Incorporated Places: April 1, 2010 to July 1, 2015". Retrieved July 2, 2016. ↑ United States Census Bureau. "Census of Population and Housing". Archived from the original on May 11, 2015. Retrieved August 30, 2013. ↑ "Annual Estimates of the Resident Population: April 1, 2010 to July 1, 2012". Retrieved August 30, 2013. ↑ Bristol, TN City Council Members Archived December 6, 2012, at the Wayback Machine. ↑ Bristol Police Department website Archived April 17, 2008, at the Wayback Machine. Wikisource has the text of the 1911 Encyclopædia Britannica article Bristol (Tennessee). Wikimedia Commons has media related to Bristol, Tennessee.